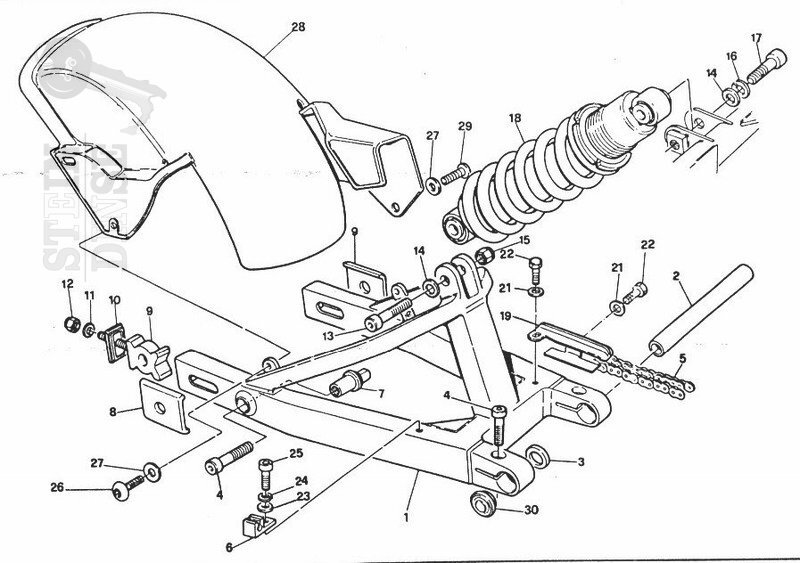 Just looked at the online parts catalogue from Stein Dinse https://www.stein-dinse.biz/eliste/inde ... =ggg&lg=en and there`s one shim shown on the right inner side of the swingarm (#3). If that is the one it`s either 20,5x36x0,1mm or x0,2mm. Saw that .... doesn't make sense to have swingarm directly on to engine casing? Last edited by The Paua Poacher on Fri May 27, 2016 10:11 pm, edited 1 time in total. I just reinstalled the swing arm on my 900. There is one washer/spacer on the inside of each side of the swing arm, resting between the swing arm and the engine cases. Here is a photo of the shim between my swing arm and the engine cases. you can look at later SS series manuals, and it has basically the same set up, but a different diameter pin. General rule is to set the chain side to the stock size, and shim the right side to fit. If you can, fill the gap with 2 washers instead of 1, as it will make a better bearing. Grease them before you assemble them. The grease also helps hold them in place during assembly. If you don't have enough spare shims, you can find them under the name of Arbor Shims, and can often get a set of them for $20-30. May be cheaper than ordering shims from Ducati. If you painted the cases, you should sand off the paint on the flange around the bearing boss, as it is a friction surface, and intended to take side loads. Stock shims are carbon steel, and will rust. You can get aftermarket shims of SS, but they are softer. probs should have read these posts prior to install, i will post photos when i can , cheers ,Rob.